Side dishes can often slip into this comfort zone of mashed or baked potatoes and some frozen veg. Don't get me wrong, mashed potatoes are fantastic and I could eat a plateful, pretty much anytime. At the same time, exciting side dishes created with ordinary, humble vegetables make a meal memorable. ■ Peel and slice the onions into ¼ inch thick slices. Carefully place them on a parchment lined baking sheet, keeping the rings intact. Drizzle with olive oil and season with salt and pepper. Roast at 375 for about 15 minutes. ■ While the onions are roasting, place the heavy cream and wine in a small saucepan and simmer until it starts to bubble around the edges. Remove from heat and set aside. 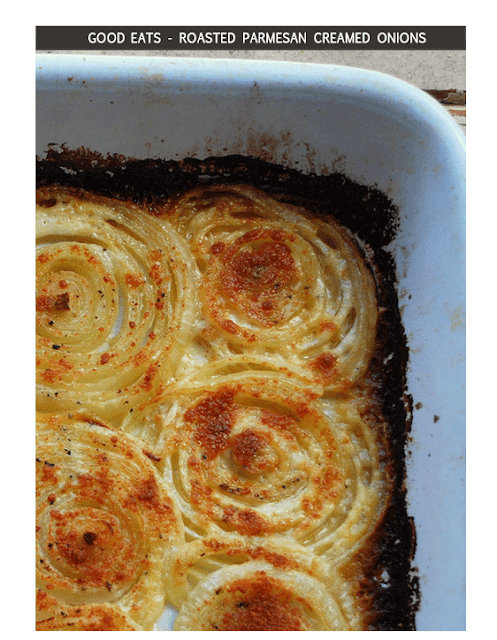 ■ After the onions are out of the oven, carefully transfer them to a shallow baking dish, again, keeping the rings intact. Slowly pour the cream sauce over all the onions. You can add more black pepper at this point if you’d like. Raise the oven temp to 450. Sprinkle each onion with grated or shaved Parmesan cheese. ■ Cover baking dish with foil and return to the oven for another 20 – 25 minutes. Remove foil and let the onions get nice and brown and caramelized for about 5 more minutes.